Description: Bill Burke, who was honored as a Mastersmith June 2008, is known for creating some of the best chefs knives and hunters that can be found anywhere. His attention to geometry and balance on his chef's knives, not to mention the exceptional edge holding clearly sets him apart. This yanagi has been in a private collection and has never been used to cut. It was made in the spring of 2010 and was the first single bevel knife that Mastersmith Bill Burke made. Yanagiba are used for slicing the raw fish (Sashimi) traditionally served by the Japanese and is also suitable for fine slicing of other meats. The knife is accompanied by a saya made specifically to the blade for a perfect fit. 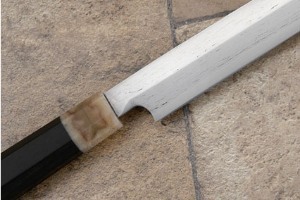 This ho wood sheath protects the blade for chefs on the go or while in the drawer. 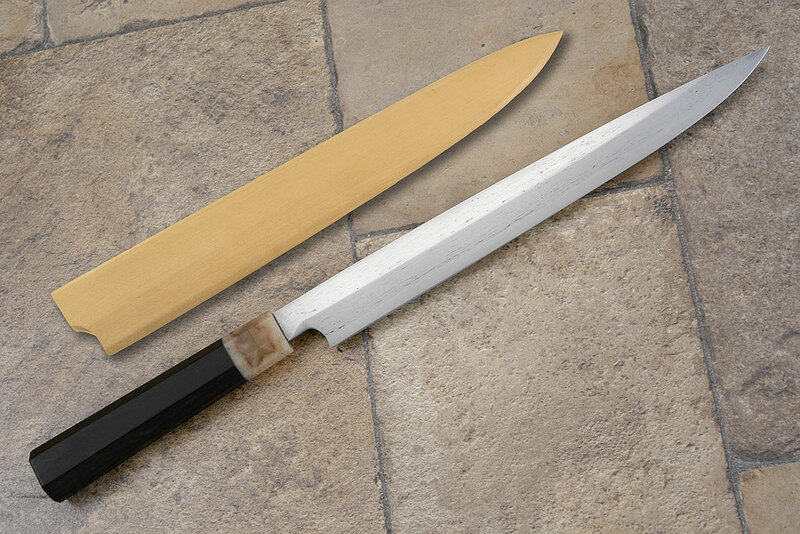 Traditional Japanese chef's knives differ from European styled knives in that they are sharpened with a bevel on only one side. The opposite side is hollowed for food release. 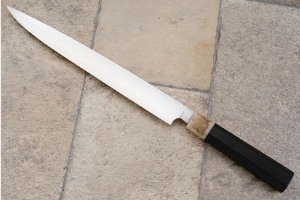 Consequently, this right-handed knife can be honed to a sharper edge than can double bevel knives. The blade was forged using the Kasumi technique -- a forging process which creates the misty appearance at the lamination line between two kinds of metal. It was hand forged from a combination of hard 52100 carbon steel (Hagane) forge-welded to a piece of soft, supportive wrought iron (Jigane). The wrought iron was recovered from an 1800's era anchor chain. The natural grain of the wrought iron is quite enticing! The most exacting standards as well as considerable time are required for this type of forge work. After forging and heat treatment, the blade is tempered for a razor sharp, long lasting edge. 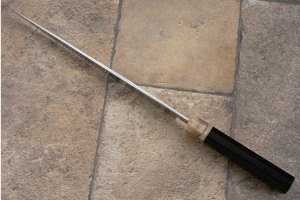 The traditional octagonal handle is formed from African blackwood and has a front, blonde sheep horn ferrule. This spacer is created by taking two sheep horn end-cuts and aligning them outward, producing a very pleasing effect. 0.341796875 0.138671875 341.796875 138.671875 Trailer Completed.